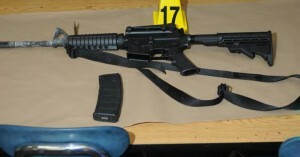 A Connecticut judge denied a motion to dismiss a lawsuit against the manufacturer and sellers of the Bushmaster AR-15 rifle used in the 2012 Sandy Hook Elementary School shootings that left 26 people dead in Newtown, Connecticut. The plaintiffs argued that the Dec. 14, 2012 mass shooting, that killed 20 children and six teachers, was well within the scope of the risk of promoting a rifle designed to inflict maximum causalities. The shooter, Adam Lanza, 20, used a Bushmaster XM15-E2S that his mother, Nancy Lanza, legally purchased and stashed at their Newtown home. Lanza opened fire at the elementary school after he killed his mother. He then turned the gun on himself when police arrived. Both sides are scheduled to be back in court Tuesday.